August 2013 | Recognizing that we are facing a unique moment when video can be used to catalyze efforts to prevent gender-based violence taking place around the world, WITNESS launched a multi-year networked campaign in partnership with Women’s Initiatives for Gender Justice in 2010. 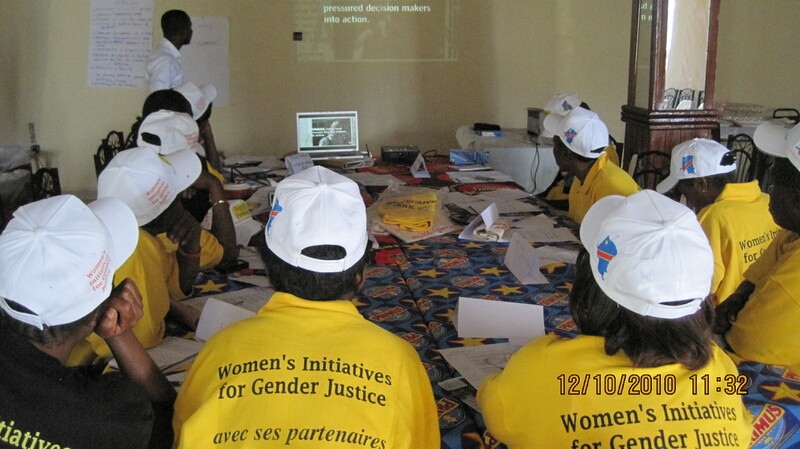 Through this partnership, we have been able to train 37 women’s rights activists over the course of three trainings. In addition to the trainings, five groups were selected for intensive long-term video advocacy campaign partnerships. As WITNESS winds down our network partnership work, we wanted to spotlight some of video advocacy campaigns that have been produced as a result of this work. Democratic Republic of Congo. Our Voices Matter: Congolese Women Demand Justice and Accountability, which featured the stories of survivors of sexual violence, was screened to the Justice Minister and her cabinet, the cabinet of the Minister of Gender, the International Criminal Court’s Office of the Prosecutor, and many UN representatives, members of the DRC parliament, DRC government officials, and media representatives. The Justice Minister committed to fulfilling many of WITNESS’ advocacy goals, such as implementing and enforcing key judgments in sexual violence cases in the eastern DRC and accelerating prosecutions. The video was also screened on RTNC national television, which reaches over 35 million viewers within the Congo. Kenya. Local partner Young Women’s Leadership Institute produced Bridging the Gap: Reinforcing Gender Desks in Kenya, a film advocating for creating safe reporting spaces for victims of gender-based violence in police stations. This film will be screened to police officials and community health and service providers in Nairobi. Kyrgyzstan. Women’s Support Center in Kyrgyzstan produced a short video, Bride Kidnapping is a Crime, for International Women’s Day 2012. The videos will be used to pressure the Ministry of Internal Affairs and Kyrgyz Parliament to improve the enforcement of existing laws. Northern Uganda. After the Speaker of Parliament saw the video No Longer Silent: Women from Northern Uganda Demand Livelihood and Psychosocial Support, she agreed to write to the President, Prime Minister, and Minister of State for Northern Uganda in support of the campaign; she also committed to screening the video before Parliament. After the Speaker of Parliament saw the video No Longer Silent, she agreed to write to the President, Prime Minister, and Minister of State for Northern Uganda in support of the campaign; she also committed to screening the video before Parliament.